Jehovah's Witnesses worshipped Jesus until 1954, after which they were told such worship was idolatrous. This made them a polytheistic religion for most of their history. The core to religion is God, and to change the God you worship is to change the very essence and basis of the religion. Of the countless alterations in Witness doctrine, the one regarding the Worship of Jesus is most important of all. The major issues concerning the history and doctrine of the Jehovah's Witnesses are prevalent within the Watchtower doctrine of Jesus, clearly highlighting the manner in which the leaders operate. These pandemic symptoms are threefold. Russell taught that we should worship Jesus and the initial Watchtower Charter's specified that establishment of the Watchtower Society was to promote the worship of Jehovah and Jesus. Yet since the 1950's, worshipping Jesus became regarded as wrongful idolatry. Russell promoted the worship of Jesus and prayer to him because he is our God. Knorr continued to teach we should worship Jesus and the 1940's Watchtower articles still stated that Jesus was to be worshipped. In 1945, Knorr amended the Watchtower's legal Charter. 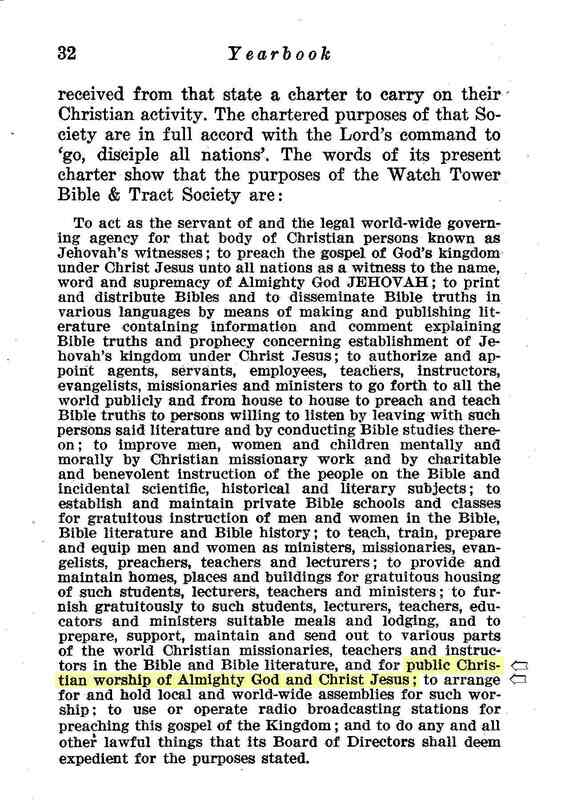 Included within the Charter was the statement that the purpose of the Watchtower Society is to promote the worship of Jehovah and Jesus. To act as the servant of and the legal world-wide governing agency for that body of Christian persons known as Jehovah's Witnesses to preach the gospel of God's kingdom under Christ Jesus unto all nations as a witness to the name, word and supremacy of Almighty God JEHOVAH; to print and distribute Bibles and to disseminate Bible truths in various languages by means of making and publishing literature containing information and comment explaining Bible truths and prophecy concerning establishment of Jehovah's kingdom under Christ Jesus to authorize and appoint agents, servants, employees, teachers, instructors, evangelists, missionaries and ministers to go forth to all the world publicly and from house to house to preach and teach Bible truths to persons willing to listen by leaving with such persons said literature and by conducting Bible studies thereon to improve men, women and children mentally and morally by Christian missionary work and by charitable and benevolent instruction of the people on the Bible and incidental scientific, historical and literary subjects to establish and maintain private Bible schools and classes for gratuitous instruction of men and women in the Bible, Bible literature and Bible history; to teach, train, prepare and equip men and women as ministers, missionaries, evangelists, preachers, teachers and lecturers to provide and maintain homes, places and buildings for gratuitous housing of such students, lecturers, teachers and minister; to furnish gratuitously to such students, lecturers, teachers, educators and ministers suitable meals and lodging and to prepare, support, maintain and send out to various parts of the world Christian missionaries, teachers and instructors in the Bible and Bible literature and for public Christian worship of Almighty God and Christ Jesus; to arrange for and hold local and world-wide assemblies for such worship to use or operate radio broadcasting stations for preaching this gospel of the kingdom; and to do any and all other lawful things that its Board of Directors shall deem expedient for the purposes stated." Click for scan. Following is a snippet from the 1945 Charter where it states to worship Christ Jesus. It was not until 1999 that worship of Jesus was finally removed to simply state "arrange for and hold assemblies for religious worship;"
In the 1950's, the Watchtower changed their doctrine on Jesus to coincide with the release of the New World Translation of the Holy Scriptures. Contrary to most other translations, this new Bible version for Jehovah's Witnesses translated the word proskuneō as obeisance rather than worship whenever it referred to Jesus. This is despite the fact that with almost every other occurrence, the New World Translation translates proskuneō as worship. Proskuneō occurs 60 times in the Greek Scriptures. Of the 17 times it applies to Jesus, all 17 occurrences were translated by the New World Translation as obeisance. (In the 2013 revision, 2 of these times have been changed to "bow".) The only other instance where prokuneō is translated as 'obeisance' is when Cornelius bows to Peter. (Worship would be correct here as well. Peter interprets this act as a form of worship, as he rejects it immediately.) Of the remaining 42 times proskuneō appears, it is always translated as worship, regardless of whether it is referring to Jehovah, angels, humans, Satan, demons, the wild beast and its image, or idols. Why this unusual stance in connection with Jesus? This is because the teaching about Jesus was undergoing a dramatic change. The first clear statement that Jesus must not be worshipped was in 1954. From that time forward there was a new belief in the position of Jesus; that he should be neither prayed to or worshipped. Consequently, since the Scriptures teach that Jesus Christ is not a trinitarian co-person with God the Father, but is a distinct person, the Son of God, the answer to the above question must be that no distinct worship is to be rendered to Jesus Christ now glorified in heaven. On occasion the Watchtower use misquotes to hide its history or prove doctrines. For example, look at the way in which the charter is quoted since the doctrine was changed. Though a Witness is bluntly told not to worship Jesus, the Charter was not amended to reflect this new doctrine until 1999. Therefore, for 45 years Witnesses were counselled against worshipping Jesus even though to do so was stated as the express reason for the existence of the Watchtower Society. This is despite the fact that it is considered idolatry to worship and pray to Jesus and will result in a Witness being disfellowshipped. It is interesting to see how the Watchtower dealt with having in its charter that Jesus is to be worshipped. They either misquoted it or avoided it completely. The Yearbook of 1969 p.50 leaves the words "and Christ Jesus" out altogether, cheekily replacing them with dots. "for public Christian worship of Almighty God … ; to arrange for" Click for scan. 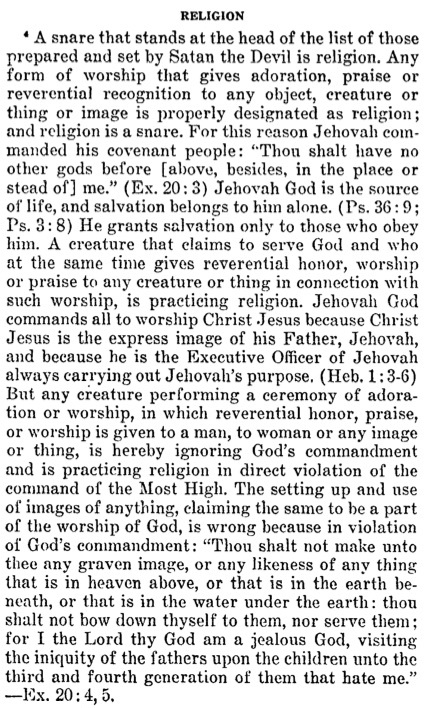 The section of the charter shown above is quoted almost in full in the footnote of the 1971 Watchtower on page 760, altering one small but significant word (which it correctly places in brackets) to significantly hide and change the true meaning of the sentence. The 1993 Proclaimers book, outlining a history of the Watchtower Society, failed to even admit what is in the Charter. 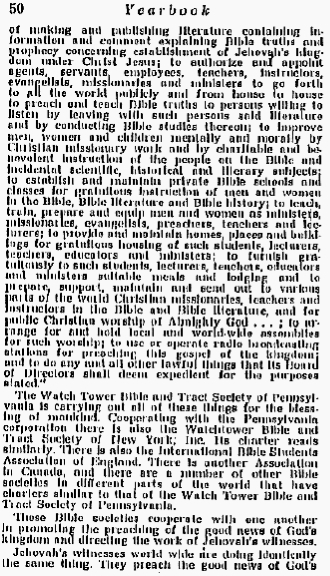 Up until 1938, the Watchtower title included the words Herald of Christ's Presence. In 1939, the title of the January 1st issue changed to The Watchtower and Herald of Christ’s Kingdom. On March 1st, 1939 the word Christ was removed and replaced with Jehovah. To this day it is now The Watchtower Announcing Jehovah's Kingdom. It is interesting to understand why it was originally taught that Jesus is a God worthy of our worship and prayers. John 1:1 " and the Word was a god." John 20:28-29 "In answer Thomas said to him: "My Lord and my God!" Jesus said to him: "Because you have seen me have you believed? Happy are those who do not see and yet believe."" The Bible repeatedly says that Jesus was worshipped. The New World Translation is virtually alone in translating the word proskuneo as obeisance. Yet look at the context of the following scripture to understand that the thought given is one of reverential worship. Hebrews 1:6 "But when he again brings his Firstborn into the inhabited earth, he says: "And let all God's angels do obeisance (proskuneo, worship) to him." John 1:2-4 "This one was in [the] beginning with God. All things came into existence through him, and apart from him not even one thing came into existence. What has come into existence by means of him was life, and the life was the light of men." Acts 7:59 "And they went on casting stones at Stephen as he made appeal and said: "Lord Jesus, receive my spirit." Stephen prayed to Jesus whilst being stoned to death. Unlike most translations, the New World Translation uses the word appeal instead of prayer. However, the footnote to New World Translation, 1950 edition, states (footnote b: "invocation; prayer"). The Emphatic Diaglott by Benjamin Wilson and published by the Watchtower Society also refers to "the prayer of Stephen" in its' footnote. Regardless of whether Stephen appealed or prayed to Jesus, it is clear what the writer meant. The reason the New World Translation is averse to using the word prayer is that it is an indication of worship. Can you imagine what would happen today if an elder stood on the platform and prayed to Jesus instead of Jehovah? "I am Jehovah your God, who have brought you out of the land of Egypt, out of the house of slaves. You must not have any other gods against my face." By current Watchtower teaching, until 1954 Russell and all Jehovah's Witnesses were idolaters, a sin Revelation 21:8 describes as worthy of the second death. If that is the case, they cannot be part of the 144,000 heavenly rulers. Early Jewish Christians grappled with this concept. Their background was Monotheistic, yet they were to worship Jesus, pray to him and refer to him as God. This left first century Christians with both a Father and a Son referred to as their God, their creator and to be worshipped; yet they could not accept polytheism. The way to resolve this quandary was to say that Jesus and Jehovah together make up the one God. This understanding is referred to as Binitarianism, and L. W. Hurtado presents a strong case that this was the original position of first century Christianity, a position borne out of necessity to maintain a religion that worshipped only one God. The very earliest of the Christian writers describe Jesus as immortal (Mathetes), God (Justin Martyr) and co-equal (Tertullian) with the Father. Further development to the Binitarian concept was Trinitarianism, which saw New Testament writings as indicating the personage of the Holy Spirit as part of the Godhead. It is with this understanding that a Witness can start to consider that the current Watchtower doctrine of God does not have strong Scriptural support. When significant Watchtower doctrine change, you have to question whether the Holy Spirit directs the Governing Body in doctrine. Once you recognise that Watchtower articles dishonestly hide information, each Watchtower will be read with a touch of suspicion. You can hardly begin to comprehend how much of what you accept as fact you will now need to start to question. Written 2005. Latest update Dec 2014.